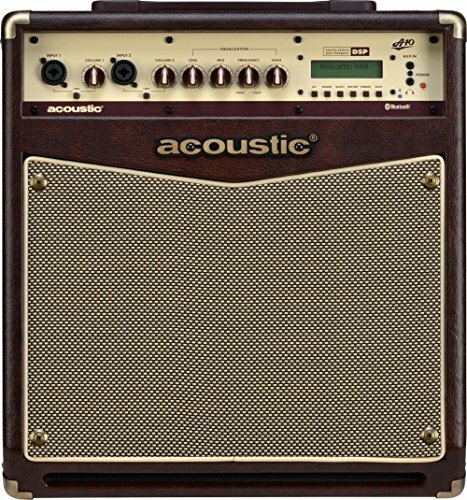 A40 40W Acoustic Guitar Combo Amp. The A40 Acoustic Instrument Amp is a full-featured amplifier that can double as a portable PA. You can connect your acoustic-electric instruments or any microphone via two combo inputs with independent level controls. And with 40 watts of power the studio-monitor style speaker provides amazing sound. The digital effects processor lets you customize and store your effects and the DSP-based automatic feedback elimination circuit constantly scans for and eliminates feedback. The Bluetooth connectivity provides an ultra-easy playback interface for your mobile devices. The direct output means you can interface with any external PA system, and the monitor style cabinet offers exceptional live sound monitoring. If you have any questions about this product by Acoustic, contact us by completing and submitting the form below. If you are looking for a specif part number, please include it with your message.